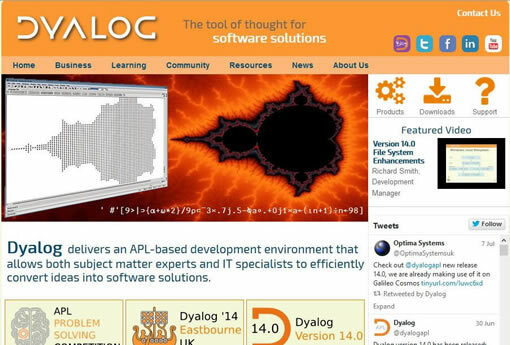 It's here – Dyalog's new website has gone live! When did you last check out www.dyalog.com? If it was more than three weeks ago, then take a look at our new website. Much consideration, discussion and hard work has gone into the development of our new website. If you have ever been involved in making a website, you'll know that it's a bit like doing a jigsaw puzzle without actually having the finished picture you want to create in front of you. We had a general idea of how we wanted to present the content and how to make it easy for visitors to find the information they need. With that in mind, we decided to work with designated rooms on the site – Business, Learning, Community, Resources and News. The intention is to make it as easy as possible for a website visitor to identify themselves with one of the rooms and go straight there for information. We would value your feedback in terms of navigation and ease of use. More to the point, if you think there is something we have missed that you would like to be able to find on the site, please let us know to website@dyalog.com.